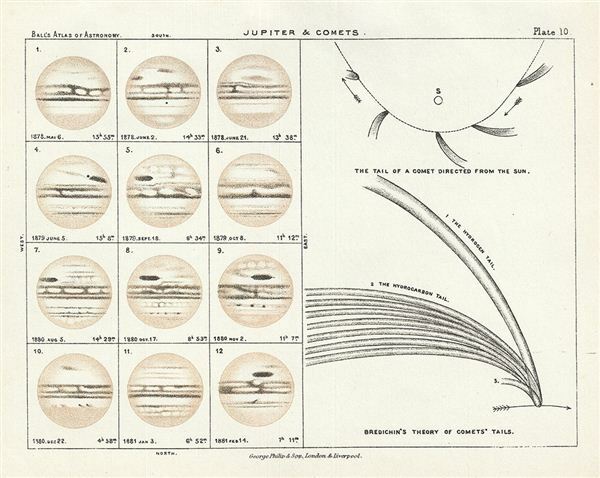 This is a fine example of Philip's 1892 map or chart of Jupiter and comets. Divided into two sections, the right section of the map features two diagrams depicting 'The tail of the comet directed from the Sun' and Bredichin's theory of comets' tails.' The left section of the map is further divided into twelve smaller portions which together represent the planet in some of its ever-changing aspects. This spans from images of Jupiter from May 6 1878 15h 55min to 14 Feb 1881 7h 11min. This map was issued as plate 10 in in Sir Robert Stawell Ball's An Atlas of Astronomy and published by George Philip and Sons of London and Liverpool. Ball, R. S., An Atlas of Astronomy A Series of seventy-two plates (London, George Philip) 1892.